Americans consume, on average, 3 1/2 pounds of avocados each year — more than double what it was 10 years ago. 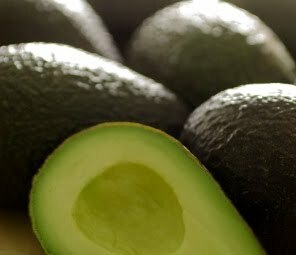 Hass avocados, the small, bell-shaped, basic avocado are mostly produced in California (80% of those in the US are Hass avocados from California) . And they are a fruit as they contain a seed/pit. I am obsessed with avocados, yep. I am. And I make some MEAN guacamole — my friends all LOVE my guacamole. Yep, brag, brag, brag. It’s wonderful. 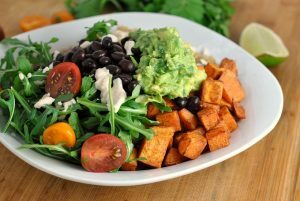 Fortunately and unfortunately, avocados average 47 calories and 4 grams of fat per OUNCE, or about 1/5th of a medium-sized Hass avocado. If you polish off the whole fruit, you’re looking at roughly 250 calories and 20 grams of fat — 72% fat, to be specific…coming from the good fats, however, the mono and polyunsaturated fatty acids (MUFA’s and PUFA’s). Avocados are also a great source of vitamin C, folate, fiber, iron, potassium, and beta-carotene . Have a avocado that’s not quite ripe and you’re anxious from some guacamole? Throw it in a paper bag and add a banana to the bag if you have one to spare. The fruits produce a gas called ethylene which causes them to ripen quicker than in an average climate . It works like a charm, promise (I have a minor in chemistry, I can’t help my nerdiness at times…)! Now…for the good stuff. 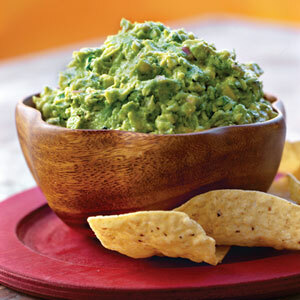 I used to have guacamole “cook-off” competitions with my roommates back in college. I take guac-making VERY, VERY seriously. 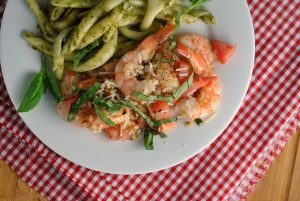 Try out my recipe and let me know what you think! Mash together and savor on a whole wheat tortilla chip. Yummmmmmmmmmm!
. Kayal, Michele. Avocados Are High in Fat, but High In Nutrients, Too. Freep. August 98, 2009.